Veg Schezwan Noodles Recipe Video | How to Make Veg Schezwan Noodles. Learn to make this Veg Schezwan Noodle is a fragrant and appetizing Indo-Chinese dish with step by step video tutorial. 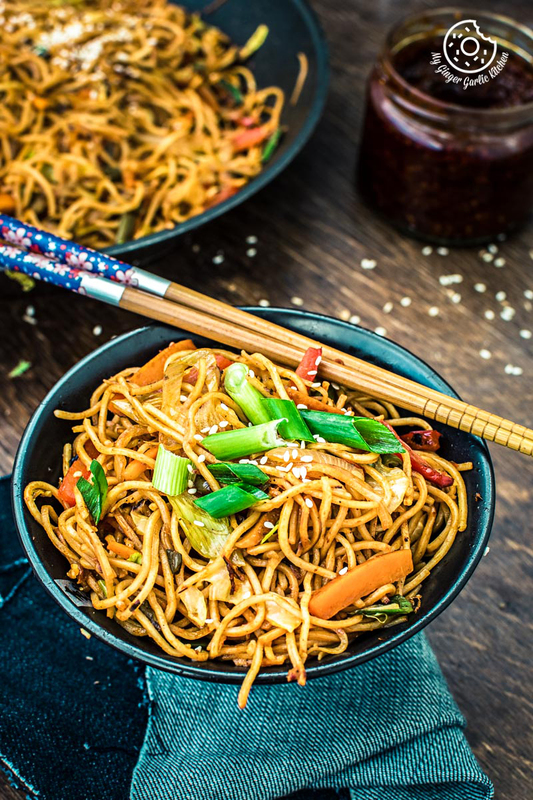 Nutritious and crunchy stir-fried veggies paired with spicy sauce give a detailed hot and smoky flavor to these noodles. Life feels so well with these Veg Noodles. What else do we need for any weeknight feast? 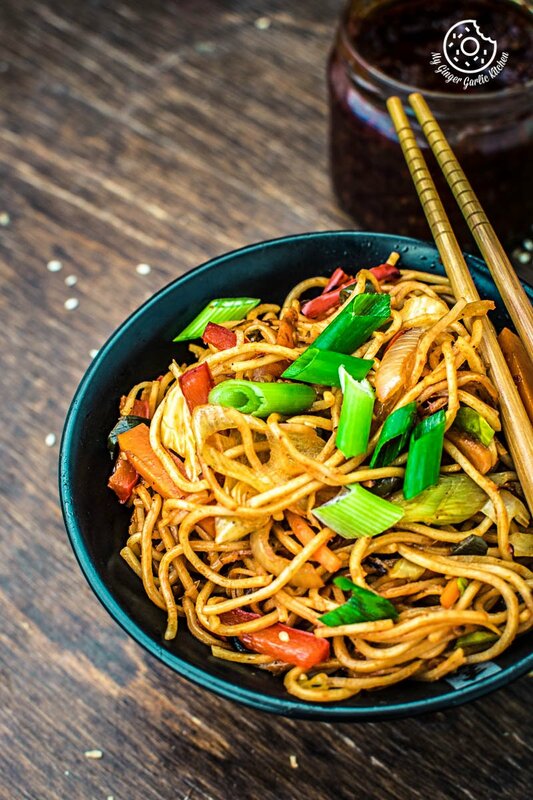 Sometimes a weeknight meal calls for a bowl full of spicy noodles. Well, in my case that sometimes comes quite often. And why not? Especially, when everything is so good in a dish — and Asian style noodles are always a great choice whenever noodles cravings strike. Noodles always come to my mind whenever I want to eat a take-out kinda food at home. And schezwan noodles really saves the time. This filler and satisfying noodles make a great main dish for any weekday lunch or dinner. This Veg Schezwan Noodle is a clear bliss. For me, they are an ultimate pleasure food. Here within my family, noodles are considered as a happy meal. And since we are what we eat, so if noodles make me happy and they’ll surely make tummy happy, and this will lead to a happy soul. I mean, when your belly is fully charged with the enjoyable food, then you find all the great things in life. Isn’t it? The great point is that they are way too better than takeaway parcels. It’s because it’s entirely homemade. And anything homemade with love, is so fresh and healthy, isn’t it? Plus, if you have your noodles pre-boiled, then you’ll need very little time to cook this. Furthermore, if your veggies are already sliced and waiting to go into a dish, then making these noodles is even quicker. And it doesn’t require so many fancy ingredients – that’s a plus too. 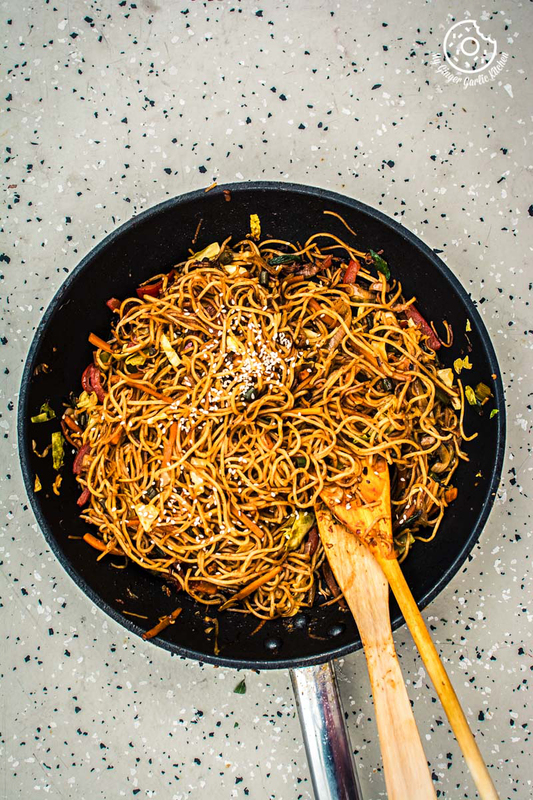 So it takes about 10 minutes to get this mouth-watering one pan dish noodles onto your table. It is super quick and easy. Isn’t 10 mins about the same amount of time when you wait in a restaurant after ordering your favorite takeaway noodles? Whenever I make schezwan noodles I use my homemade Schezwan Sauce. 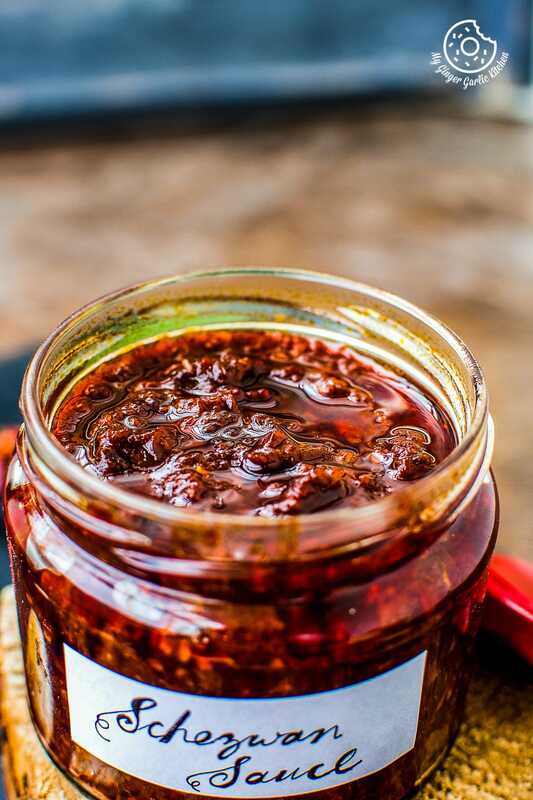 And making the Schezwan Sauce at home is really easy — anyone can make that — easy and tasty. 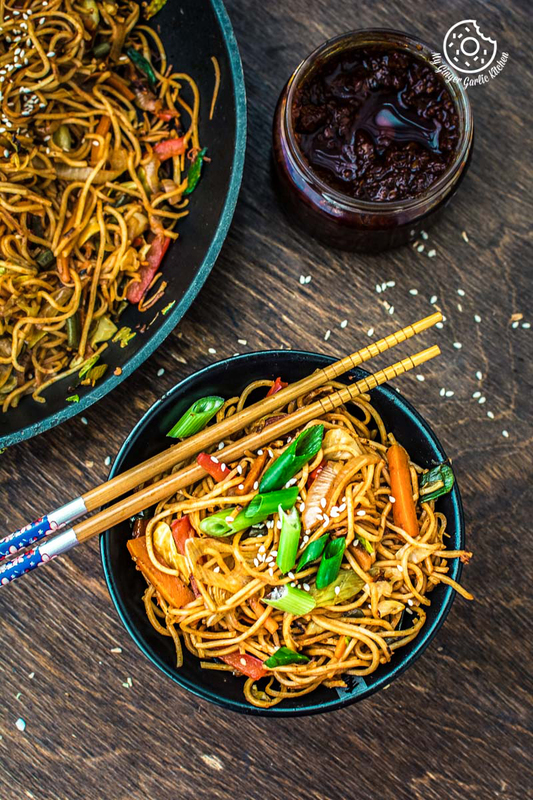 In this recipe, stir-fried vegetables are cooked in spicy garlicky Szechuan sauce and finally tossed with cooked noodles. 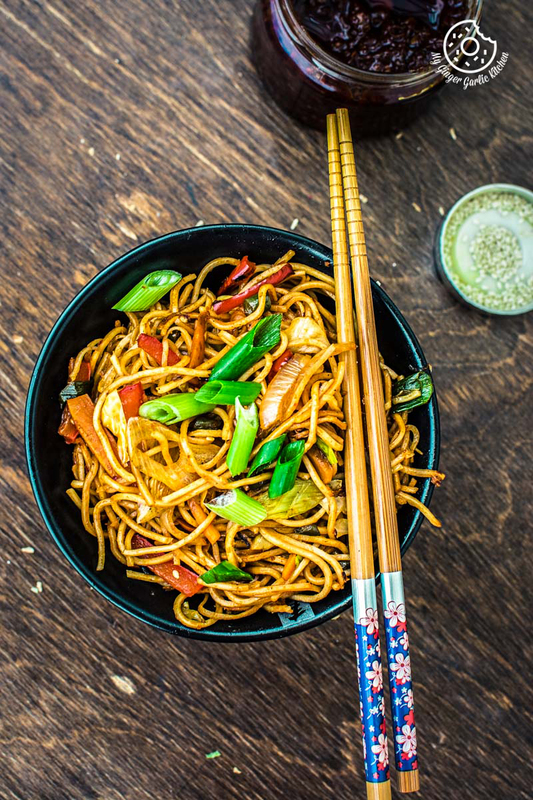 The thing is that if you love anything schezwan then you would love these Indo-Chinese noodles. A sprinkle of toasted sesame seeds make these more desirable. 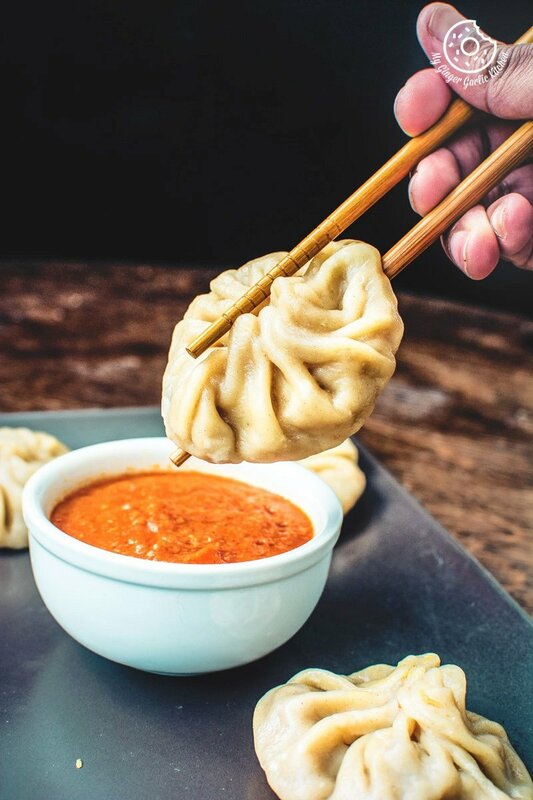 I love adding toasted sesame seeds or roasted peanuts or both to all Asian dishes, not only because they are my favorite, but also because they give an extra nutty punch to any Asian dish. 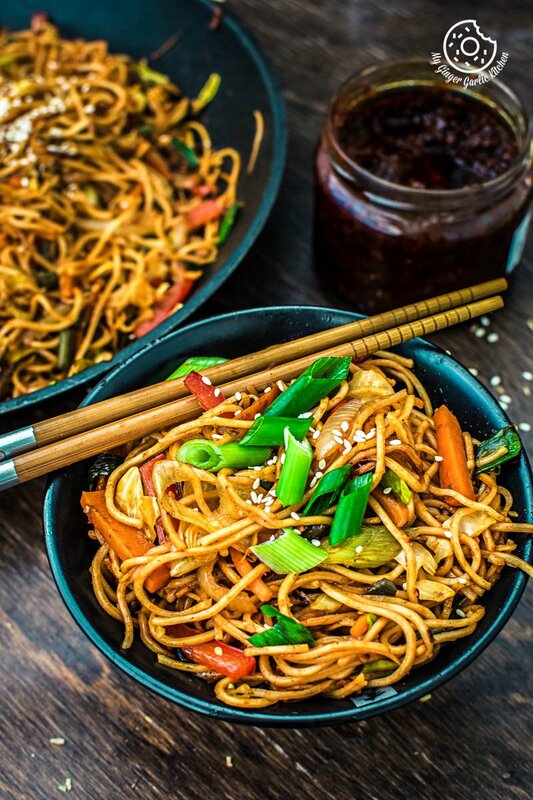 The key to making the best veg noodles is to stir-fry veggies continuously on high heat this would give a nice smoky flavor to this noodles. I have made it in a pan, but I would suggest you make it in a wok if you have one because tossing is easy in a wok. I have used sliced veggies for making these noodles, but you can also chop, shred or julienne your veggies. Using your own Schezwan Sauce is a wonderful idea. It stays good for 2-3 weeks in the refrigerator. But you can also use store-bought ones. 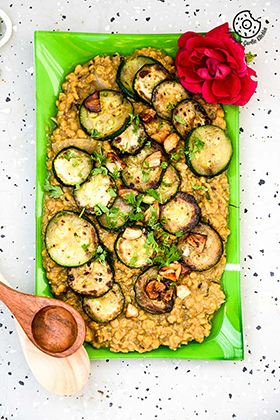 This is a spicy dish, but you can reduce the amount of schezwan sauce to adjust the heat level as per your liking. So if you want mildly flavored noodles, then simply reduce the amount of Schezwan sauce to reduce the hotness. They are best for a takeaway lunch. If you are packing this noodles for lunch, just make sure that you don’t cook veggies longer. This way your veggies will not turn soggy. 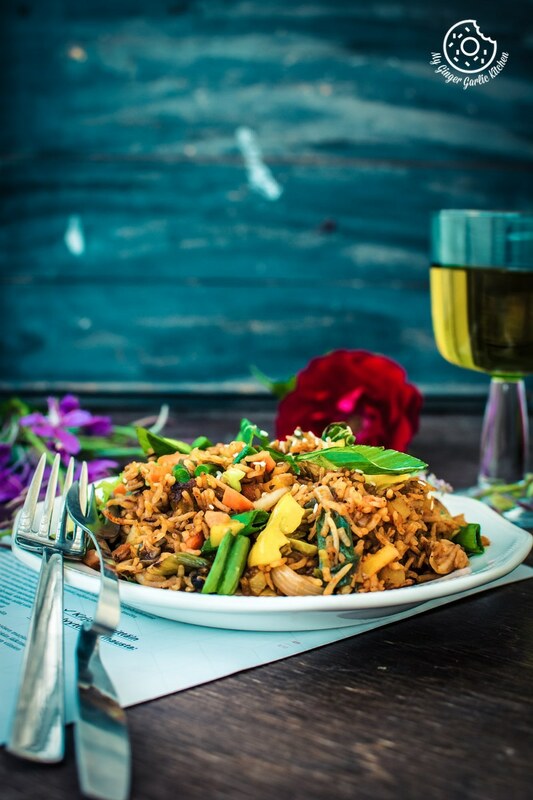 If you like this noodles recipe then you’ll surely love this schezwan fried rice I have shared earlier. 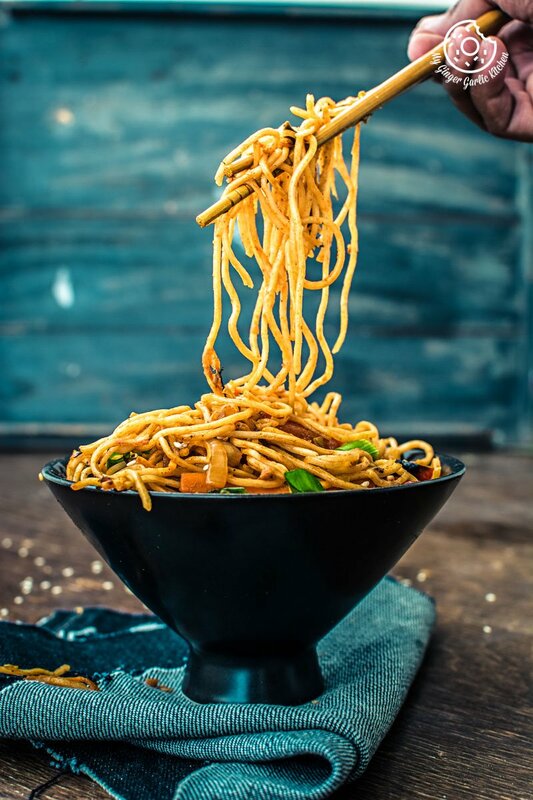 Learn to make this Veg Schezwan Noodle is a fragrant and appetizing Indo-Chinese dish with step by step video tutorial. 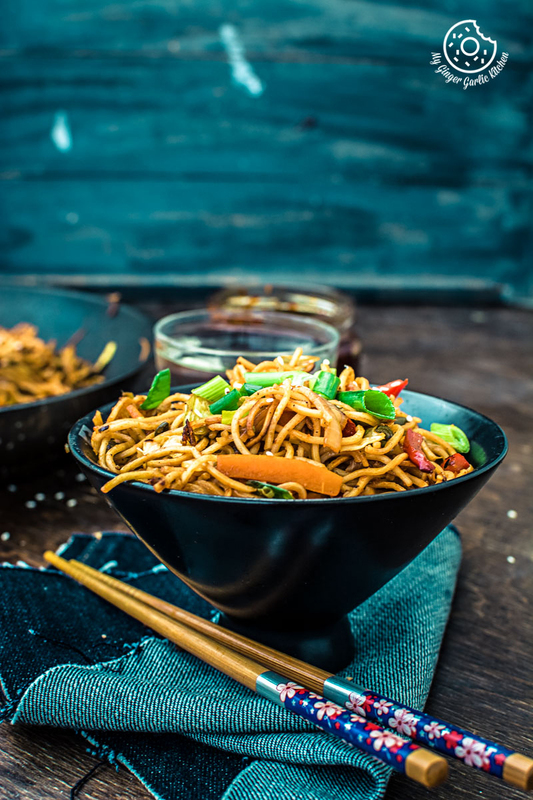 Nutritious and crunchy stir-fried veggies paired with spicy sauce give a detailed hot and smoky flavor to these noodles. Life feels so well with these Veg Noodles. 1. Boil water along with 1/4 tsp salt in a pan. Add noodles and boil until cooked. 2. Drain the noodles and add drizzle 1 tsp oil. Toss well and set aside. 3. Heat 2 tbsp oil in a pan/wok. 4. Add 1 tbsp crushed ginger-garlic and sauté for 30 seconds. 5. Add onions, carrots, beans, bell pepper, cabbage, and saute on high heat for 2-3 mins. 6. Add white vinegar, soya sauce, schezwan sauce and mix well. 7. Now add the boiled noodles, spring onion greens, ground black pepper and salt to taste. 9. Garnish with some spring onions and sesame seeds.